A well organized and stocked kitchen makes all the difference when it comes to meal prepping and cooking. Plus, having all the tools you need at your fingertips will make it more likely that you will cook at home instead of eating out! Here are some of tools I use in my kitchen. I have tried many different kitchen gadgets, from knives to different blenders, cutting boards and waffle makers. By the way, all the links will take you to AMAZON! You can click the photo for full description, reviews, and of course to purchase the item! 1. Knives & Cutting Tools – you want to have a nice sharp knife. Something that makes cutting/chopping/slicing a joy. My favorite knife ever is WustHof Classic Cook’s Knife. I have the 8-Inch version although I’ve thought about getting another, smaller, version. You gotta keep your knife in a tip top shape, that means keep it sharp! This is a great little sharpener and you can sharpen other (steak) knives with it. Speaking of steak knives, I’m not a fan of serrated anything. I like making a swift cut instead of “sawing” my meat. 2. Cutting Board – you want a board that’s big and easy to clean. Of course you can get super fancy with good looking boards but for me functional board is more important. I have a wood board that I bought at a local market and I never use it because it looks too pretty! 3. Bench Scraper – I have only recently discovered these nifty little things. You know how sometimes it is a pain to pick up the entire cutting board to scrape off the veggies/meat/whatever into a pan? Well, you can scrape off your board with these! Added bonus they will keep your knives sharp, since you aren’t really supposed to scrape the board with that pricey knife! 4. 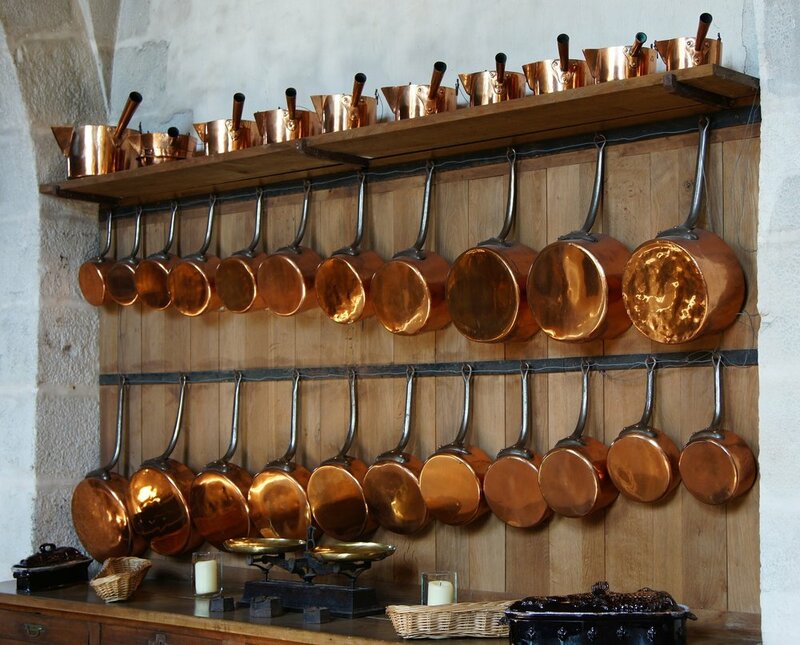 Pots and Pans – here you can range anywhere from really cheap to pretty pricey. It all depends on what you fancy. We’ll keep things simple. This cookware set from T-Fal is pretty solid and non-stick. It’s cheap enough that if something gets scratched up, it won’t break the bank to replace it. And I do recommend you replace any non-stick surface with excessive scratches. 5. Utensils – Once again this is a huge preference thing, here is what I use on the daily! 6. Kitchen Scales – once again there are so many different ones and I think I’ve tried them all! This one comes with a bowl and a timer you can set. This one is solid and comes with variety of colors. 7. Prep Bowls – I have many bowls, they are very useful! You can prep in them, you can eat huge salad out of them. I like these because they have lids, but don’t microwave them because…chemicals. You can microwave these though and they look cool, they also go down to the tiniest of sizes. So you can make sauce for ants. 8. Meal Prep Containers – now that you’ve cooked all this delicious food go ahead and separate it out into meals. These containers are great for that. Okay that’s enough for this post! The goal is to post more of these types of blog posts, baking, coffee, spices, electronic gadgets, etc. If you have any suggestions or would like a specific blog post please comment below!